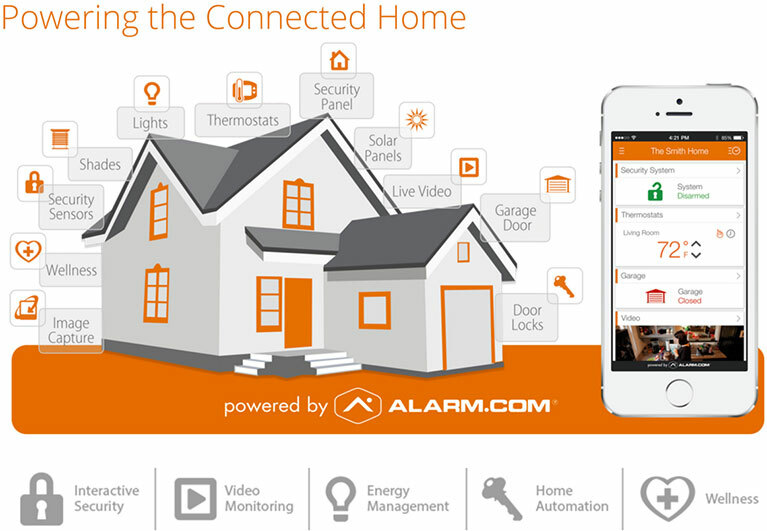 Smart Home Monitoring & Home Automation in Toronto & GTA with Alarm.com makes it easy for you to control your connected security devices from anywhere you have a Wi-Fi connection or a cellular signal using the mobile or desktop app. With connected video cameras, push notifications are sent by SMS or email when movement is detected so you can immediately see who is around your home and take appropriate action. Smart 4U emPower™ intelligent automation allows users to control their lights, locks, window treatments, thermostats, garage door and other small devices. Smart4U Security home automation services are fully integrated with emPower™ service plans, offering the user a complete and feature rich solution! The advantages of our home automation solutions in Toronto combined with smart home monitoring provide you with unparalleled peace of mind. Conserve energy, deter theft and even know when the kids arrive home safely no matter how far away you are, right from your smartphone or desktop devises. For more information on all our Home Monitoring & Home Automation Systems, call 905-488-4393 to learn more or contact us for a free estimate today.